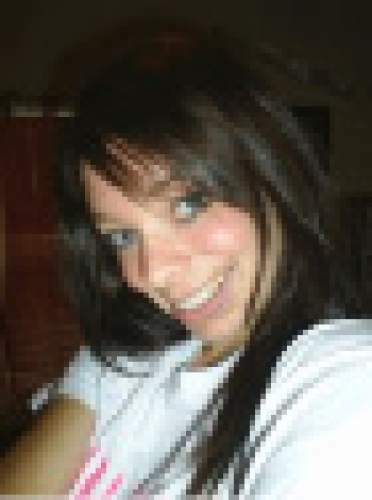 Courtesy photo Danielle Willard, 21, was shot and killed Nov. 2, 2012, by West Valley City Police detectives during a drug investigation at an apartment complex. West Valley City Council members have unanimously voted to publicly release internal affairs investigation records of one of the former officers. Former West Valley City narcotics detective Shaun Cowley has been charged with second-degree felony manslaughter in the shooting death of Danielle Willard. 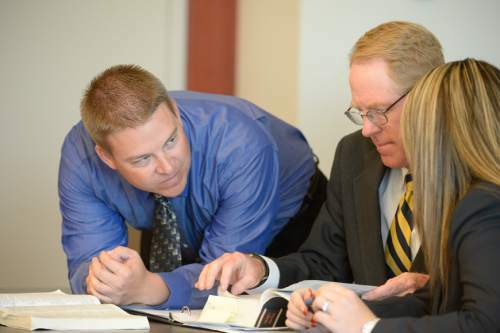 Francisco Kjolseth | The Salt Lake Tribune Former West Valley City police officer Shaun Cowley speaks with his attorney's Paul Cassell and Lindsay Jarvis just before Judge L.A. Dever was scheduled to announce whether he will order Cowley to stand trial on Thursday, Oct. 9, 2014. Cowley is charged with second-degree felony manslaughter in connection with the Nov. 2, 2012 fatal shooting of 21-year-old Danielle Willard. 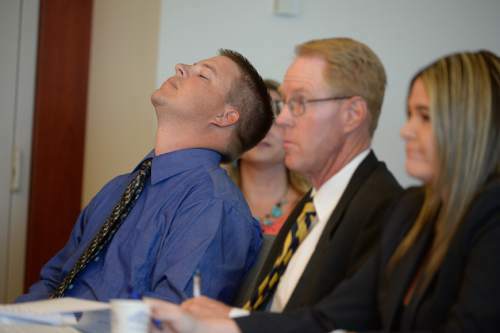 Francisco Kjolseth | The Salt Lake Tribune Former West Valley City police officer Shaun Cowley tilts his head back as hears the ruling by Judge L.A. Dever who announces he will not have to stand trial on Thursday, Oct. 9, 2014. Cowley is charged with second-degree felony manslaughter in connection with the Nov. 2, 2012 fatal shooting of 21-year-old Danielle Willard. At right are defense attorneys Paul Cassell and Lindsay Jarvis. 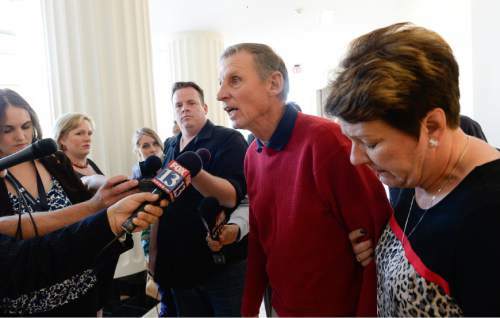 Francisco Kjolseth | The Salt Lake Tribune Former West Valley City police officer Shaun Cowley hears the ruling by Judge L.A. Dever as he announces he will not have to stand trial on Thursday, Oct. 9, 2014. Cowley is charged with second-degree felony manslaughter in connection with the Nov. 2, 2012 fatal shooting of 21-year-old Danielle Willard. 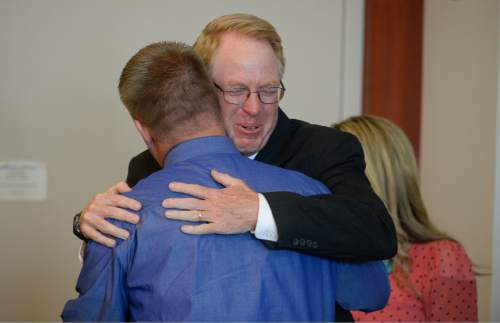 Francisco Kjolseth | The Salt Lake Tribune Former West Valley City police officer Shaun Cowley, left, receives a hug from defense attorney Paul Cassell after hearing from Judge L.A. Dever that he will not have to stand trial on Thursday, Oct. 9, 2014. Cowley is charged with second-degree felony manslaughter in connection with the Nov. 2, 2012 fatal shooting of 21-year-old Danielle Willard. 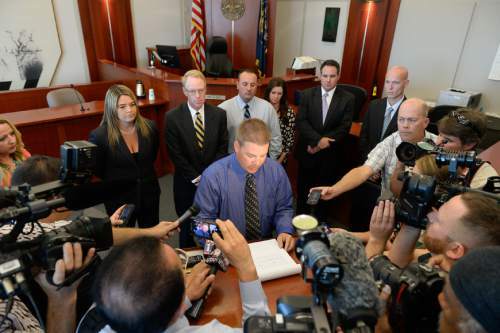 Francisco Kjolseth | The Salt Lake Tribune Former West Valley City police officer Shaun Cowley gives a statement to the media following the ruling by Judge L.A. Dever that he will not have to stand trial on Thursday, Oct. 9, 2014. Cowley was being charged with second-degree felony manslaughter in connection with the Nov. 2, 2012 fatal shooting of 21-year-old Danielle Willard. 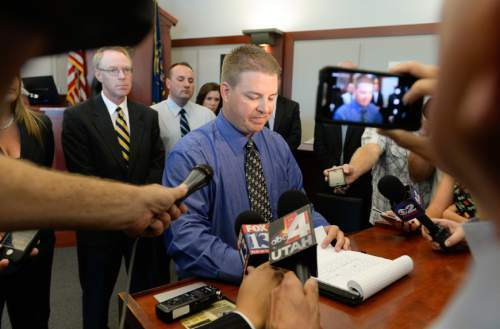 Francisco Kjolseth | The Salt Lake Tribune Judge L.A. Dever rules that former West Valley City police officer Shaun Cowley will not have to stand trial on Thursday, Oct. 9, 2014. Cowley was being charged with second-degree felony manslaughter in connection with the Nov. 2, 2012 fatal shooting of 21-year-old Danielle Willard. 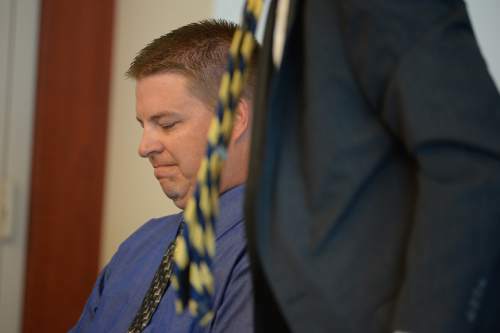 Francisco Kjolseth | The Salt Lake Tribune Prosecutor Blake Nakamura listens as Judge L.A. Dever rules that former West Valley City police officer Shaun Cowley will not have to stand trial on Thursday, Oct. 9, 2014. Cowley was being charged with second-degree felony manslaughter in connection with the Nov. 2, 2012 fatal shooting of 21-year-old Danielle Willard. 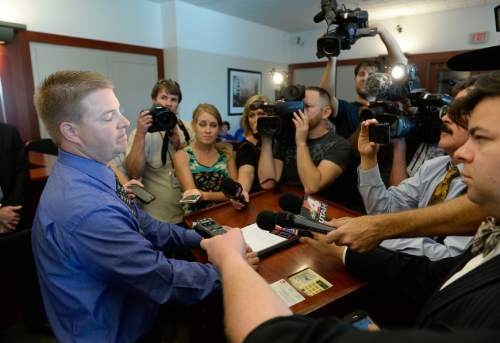 Francisco Kjolseth | The Salt Lake Tribune Former West Valley City police officer Shaun Cowley gives a statement to the media following the ruling by Judge L.A. Dever that he will not have to stand trial on Thursday, Oct. 9, 2014. Cowley was being charged with second-degree felony manslaughter in connection with the Nov. 2, 2012 fatal shooting of 21-year-old Danielle Willard. 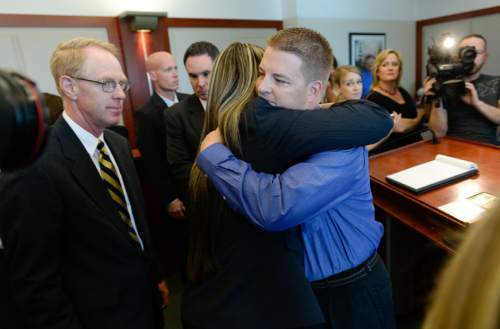 Francisco Kjolseth | The Salt Lake Tribune Former West Valley City police officer Shaun Cowley gets a hug from his defense attorney Lindsay Jarvis after hearing from Judge L.A. Dever that he will not have to stand trial on Thursday, Oct. 9, 2014. 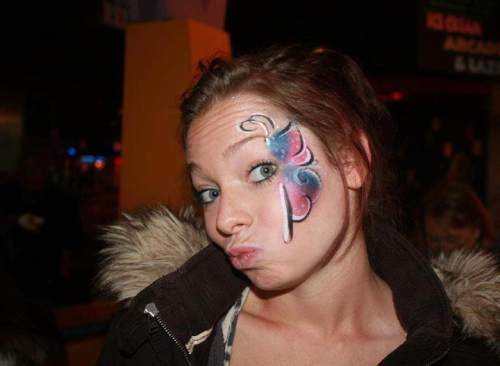 Cowley was being charged with second-degree felony manslaughter in connection with the Nov. 2, 2012 fatal shooting of 21-year-old Danielle Willard. Francisco Kjolseth | The Salt Lake Tribune Former West Valley City police officer Shaun Cowley gives a statement to the media following the ruling by Judge L.A. Dever that he will not have to stand trial on Thursday, Oct. 9, 2014. Cowley was being charged with second-degree felony manslaughter in connection with the Nov. 2, 2012 fatal shooting of 21-year-old Danielle Willard. 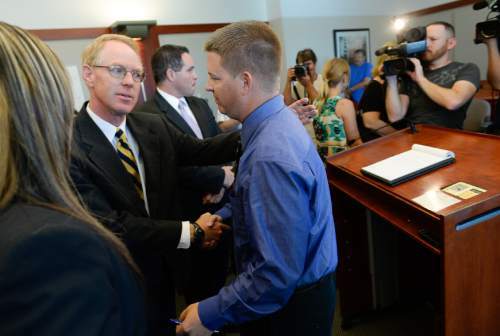 Francisco Kjolseth | The Salt Lake Tribune Defense attorney Paul Cassell shakes hands with former West Valley City police officer Shaun Cowley after hearing from Judge L.A. Dever that he will not have to stand trial on Thursday, Oct. 9, 2014. Cowley was being charged with second-degree felony manslaughter in connection with the Nov. 2, 2012 fatal shooting of 21-year-old Danielle Willard. 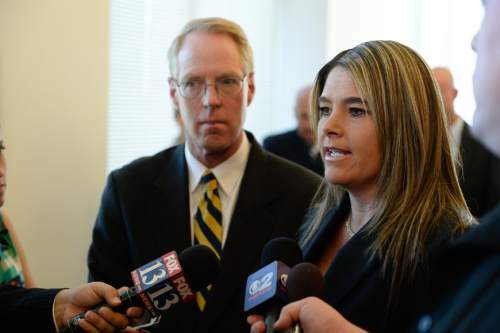 Francisco Kjolseth | The Salt Lake Tribune Scott Simons, alongside his wife Kelly, expresses his anger with the ruling that former West Valley City police officer Shaun Cowley will not have to stand trial in connection with the Nov. 2, 2012 fatal shooting of 21-year-old Danielle Willard. Scott's daughter Kelly was killed by Salt Lake police on Jan. 9. 2013. Francisco Kjolseth | The Salt Lake Tribune Defense attorney's Paul Casell and Lindsay Jarvis speak with the media following the ruling that their client, former West Valley City police officer Shaun Cowley will not have to stand trial in connection with the Nov. 2, 2012 fatal shooting of 21-year-old Danielle Willard. Former West Valley City Detective Shaun Cowley knew what happened on Nov. 2, 2012, when he pulled the trigger and killed Danielle Willard. And he knew he was justified in doing so, he said Thursday after a judge dismissed a manslaughter charge against him. "It&apos;s just a long road to get here," an emotional Cowley told reporters. Cowley, 34, said the last two years "has taken a toll" on him and his family. First, Salt Lake District Attorney Sim Gill ruled the fatal shooting unjustified in August of last year. Then, nine months later, the former detective was charged with second-degree felony manslaughter. "I&apos;ve stated all along, the evidence would show I&apos;d be acquitted," Cowley said after Thursday&apos;s ruling. "It feels good." 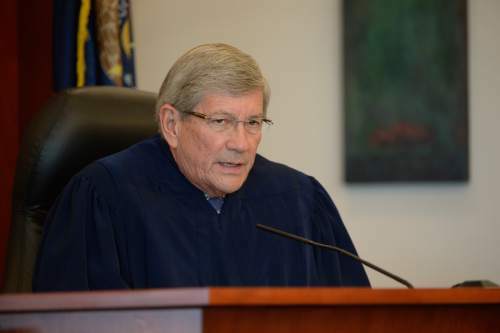 Third District Judge L.A. Dever dismissed the case after listening to three days of testimony during a preliminary hearing that ended Wednesday. Before announcing his decision, Dever went over the manslaughter charge, in which prosecutors proposed two theories of the alleged crime: that Cowley recklessly caused Willard&apos;s death; or in the alternative, that Cowley caused the woman&apos;s death under a reasonable belief that his actions were justified, though they were not. "This is not a case of the defendant acting recklessly," the judge wrote in his ruling. "The testimony establishes that the defendant consciously and deliberately acted." Dever added that there was no evidence presented to establish that the "conduct was not legally justifiable," and he said prosecutors did not establish probable cause that Cowley committed a crime. The day of the shooting, Cowley and partner Kevin Salmon were undercover and attempting to make contact with Willard, who was sitting in her parked car after she had allegedly purchased drugs. Cowley&apos;s defense team claimed he fired at Willard because he feared for his life as Willard backed her car, but prosecutors claimed the former detective was never in any danger of being hit by Willard&apos;s car. Both Cowley and Salmon fired at the woman, but Cowley fired the first and lethal bullet. In his ruling, Dever relied heavily on a police consultant retained by prosecutors who testified that Willard was moving her car in reverse toward Cowley, that this constituted obstructing justice or fleeing, and that "potentially, attempted murder was being committed against the defendant." The consultant, Salt Lake City Detective Chris Kotrodimos, also testified that Cowley could assume Willard was "trying to kill him" and that "deadly force is an appropriate response to that act," according to Dever. Kotrodimos also stated there was probable cause for a felony drug arrest, and that Willard "was not complying [and] ... that she committed more than one felony," according to Dever. Dever also cited Rosario Gullermo, an apartment resident who saw portions of the fatal encounter. Dever  who is retiring Nov. 1 after 19 years on the bench  focused on Gullermo&apos;s initial report to officers, in which she said she saw the car backing out, and then heard shots. On the witness stand, however, Gullermo insisted that it was the other way around: she heard shots and then saw the car moving. Reaction to the ruling •Minutes after the judge made his ruling, Salt Lake County District Attorney Sim Gill released a statement, saying, "We respect the process of our judicial system, even if it produces results that we may not agree with. "We filed the criminal charges that we believed were appropriate. Consistent with our system of law, we accept the Court&apos;s determination." Gill clarified later Thursday that prosecutors have not made a decision on whether they will appeal the judge&apos;s decision. Willard&apos;s mother, Melissa Kennedy, left the courtroom in tears and told news reporters she did not want to make a statement. Los Angeles-based attorney Mark Geragos, who represents Kennedy in a civil suit filed in federal court against Cowley and West Valley City, said his client felt "betrayed" by Thursday&apos;s outcome. "Clearly, this is just a further injustice," Geragos said Thursday evening. "It has no effect on our [civil case and] pursuit of justice for Danielle. It makes me more determined to hold the city and the people who work for that corrupt department more accountable." Defense attorney Lindsay Jarvis told the media that Cowley has been "villainized " during the past two years, and said the manslaughter charge  as well as Gill&apos;s determination that the shooting was unjustified  have caused a problem in the larger law enforcement community. "There are officers out there who are afraid to pull the trigger, even when faced with a situation where they could die," she said. Scott Simons, whose daughter was shot and killed by police in January 2013, sat next to Kennedy in court. "This is an outrageous ruling," Simons said after the case was dismissed. "It just shows the state&apos;s inability to prosecute police officers. Maybe they need more practice by ruling more cases unjustified." Gill ruled that the Joint Criminal Apprehension Team officer who fatally shot Kelly Simons, an alleged armed robber, was justified in doing so. Cindy Moss, the aunt of Darrien Hunt, called the Cowley decision "ridiculous." Hunt, 22, was shot and killed by Saratoga Springs police last month following a report that he was carrying a samurai sword in public, an investigation that has yet to conclude. "What would happen to me if I did that?" Moss said, adding that there is no doubt in her mind that if she "shot at someone because they were backing up near me… I would be in prison for probably life." Gina Thayne, the aunt of Dillon Taylor, said she thought the ruling was "pathetic." "My family has been through so much," she said. "I got to know the Willard family, and it&apos;s so sad it&apos;s happened like this." A Salt Lake City police officer shot and killed 20-year-old Taylor two months ago, a shooting that Gill determined was justified even though the man was unarmed. Rare dismissal •Judge Dever&apos;s dismissal of Cowley&apos;s case is unusual because the burden of proof for a preliminary hearing is so low that it is rare for a judge to dismiss a case at that stage of a prosecution. A judge must find there was "probable cause" that a defendant committed a crime to advance the case to trial. At trial, a judge or jury must find "beyond a reasonable doubt" that a defendant is guilty. Also, a preliminary hearing judge must look at the evidence in a light that is most favorable to the state. "The prosecution had a small, low bar to get over, and they tripped," said Ian Adams, spokesman for Utah Fraternal Order of Police. "We said from the beginning, that once Shaun Cowley and his defense team were able to challenge the evidence, that the public and the media would see the evidence in the case had been misrepresented deliberately since the very beginning." &apos;Reasonable belief&apos; • During closing arguments Thursday, both the defense and prosecutors focused on whether Cowley had a "reasonable belief" that his life was in danger, as he has claimed. 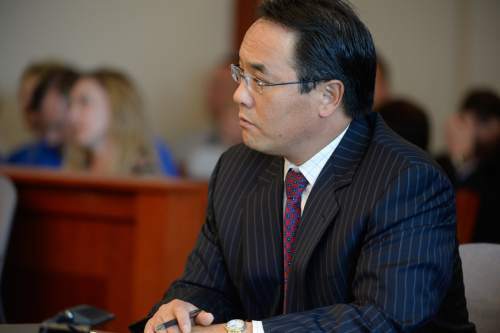 "It wasn&apos;t reasonable," prosecutor Blake Nakamura told the judge. "We don&apos;t know why he ultimately decided to use deadly force ... There is no evidence to suggest that Cowley fired at Danielle Willard with the intent to kill her. But he used his weapon in a reckless way." Defense attorney Paul Cassell had asked the judge to dismiss the charge, saying it was an "unsupported case that should have never been filed." After Thursday&apos;s ruling, Cassell said: "The judge found today that Shaun Cowley was faced with attempted murder and he properly responded with deadly force. I think this is a ruling that makes all of the citizens of Utah a little bit safer tonight." The defense team called several witnesses to the stand Wednesday, including Chris Lawrence, who specializes in use-of-force science. His testimony centered around "the speed of the encounter"  how long Cowley had to react, draw his gun and fire. He estimated that the "critical sequence of events" from when Willard began to reverse and Cowley turned his body, drew his gun and fired twice likely took only 2.5 seconds. Forensic scientist Michael Haag testifying for the prosecution on Monday said Cowley was likely standing off to the side of Willard&apos;s vehicle when he shot and killed her, and not directly behind it like the former detective claimed in a later interview. Salmon also fired his gun at Willard, but only after Cowley fired first. One of Salmon&apos;s shots struck Willard in the chin, according to court records. Salmon  who has been on paid leave since the shooting  was not charged with a crime. Vindication •Salmon was critical of Gill&apos;s decision to charge his partner, telling reporters Thursday that he felt the case was politically motivated. He said he felt both anger and relief after Cowley&apos;s case was dismissed. "I feel vindicated," Salmon said. "I feel vindicated that our side of the story was finally told and that an unbiased third party was able to look at this. Somebody with no political agenda, no monetary interest in this. And they were able to rule and make the right decision based on the evidence." Salmon revealed that he had resigned from his job Thursday because he wanted to look for employment in another law enforcement agency and that he didn&apos;t agree with changes being made within the West Valley City Police Department. West Valley City Police Chief Lee Russo said Salmon&apos;s resignation comes amid an ongoing internal investigation. He had been on paid administrative leave since the shooting. Cowley, who initially also was on leave, was fired by West Valley City last October  for allegedly mishandling evidence  but has made efforts to be reinstated. The judge&apos;s decision on Thursday does not change the department&apos;s position regarding his firing, Russo said, adding that they "feel confident in the case that we have." The next hearing date in that job appeal process has yet to be set. Regarding the now-dismissed manslaughter charge, Russo said they are "glad there&apos;s finally a resolution in this aspect of the case."  Tribune reporters Michael McFall and Erin Alberty contributed to this story.